Advanced technology precisely targets radiation to destroy cancer cells. Cancer can be complicated. In many cases, the cause of a cancer’s development is unknown or complex and poorly understood. On the other hand, the fundamentals of cancer are straightforward and well recognized. That knowledge is the inspiration behind radiation therapy as a cancer treatment. 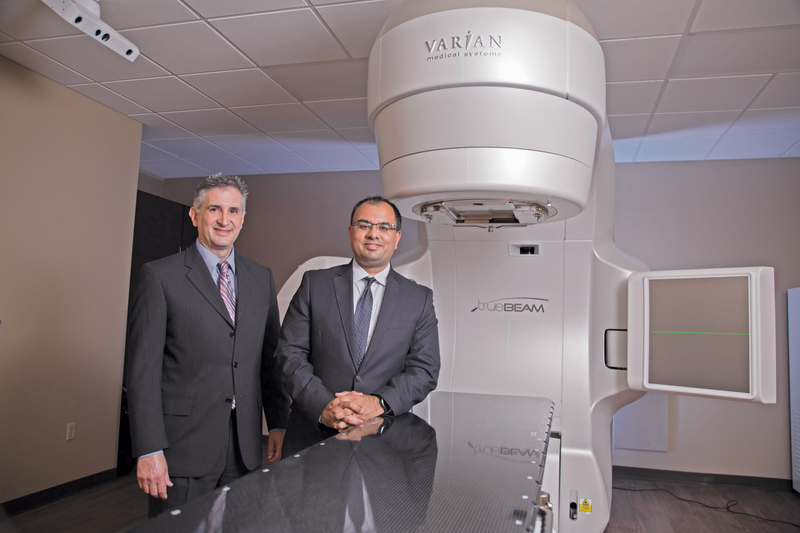 Todd V. Panarese, MD, (left) and Rahul Chopra, MD, use the Varian TrueBeam linear accelerator to treat cancer patients. “The definition of cancer is uncontrolled cellular division,” informs Rahul Chopra, MD, board-certified radiation oncologist at Cancer Care Centers of Brevard. “When cells are dividing, they use their DNA, which is essentially the instruction manual on how to divide. Radiation therapy works as a cancer treatment by interrupting the cancer cells’ dividing process, notes Dr. Chopra. “Radiation is basically packets of high energy that work at the molecular level,” he explains. “During radiation therapy, this energy is directed into the tumor where the DNA architecture of the cancer cells is disrupted. “The cancer cells no longer have their instruction manual for dividing and building new cells. Therefore, the cancer cells die off because they are not able to perform their normal functions. Radiation therapy is generally used instead of or in addition to surgery to remove cancerous tumors. It is typically the treatment of choice when a patient’s tumor is not reachable through surgery, not completely removed during surgery or when patients are not candidates for surgery. “To render patients cancer free, surgeons must have a complete resection, or removal, of the tumor and surrounding cancer cells,” Dr. Chopra educates. “If a surgeon cannot do that or if we know from oncology testing that there is still some cancer left after surgery, radiation therapy is often used to kill the remaining cancer cells. “When deciding to use radiation therapy, we evaluate the type of cancer, the stage of the cancer and the patient’s medical status. It is not used just in patients with late-stage disease when surgery has failed to remove all the cancer. Some people consider radiation therapy and chemotherapy, the use of drugs to kill cancer cells, as competing treatments. In many cases, however, chemotherapy is used in addition to radiation therapy. “Radiation therapy and chemotherapy are more like complementary therapies, rather than competing therapies, in the treatment of most solid tumor cancers,” Dr. Chopra elaborates. “Chemotherapy is not a curative treatment in these cancers, so it is used as an adjunctive, or helper, treatment. “Radiation oncology is my specialty. After a medical or surgical internship, we undergo four years of dedicated oncology training in the use of therapeutic external beam, brachytherapy and unsealed sources of radiation in the treatment of cancer and some benign disease. Radiation therapy is not a new idea, but the past decade or so has seen the development of many advanced techniques for using radiation to kill cancer cells. These include intensity-modulated radiation therapy (IMRT) and image-guided radiation therapy (IGRT). These techniques allow radiation oncologists to better reach tumors with the radiation beam during treatment. The machine used to deliver these types of radiation therapy is called a linear accelerator. Cancer Care Centers of Brevard use the latest technology linear accelerator to provide these advanced techniques of radiation therapy. It’s called the TrueBeam® radiotherapy system. “The TrueBeam allows us to perform the full gamut of radiation oncology,” Dr. Chopra confirms. “With it, we can provide IMRT and IGRT as well as stereotactic body radiation therapy, another technique for aiming the radiation. The TrueBeam enables us to deliver very focused volumes of radiation therapy to destroy tumors throughout the body. 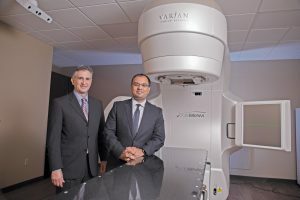 According to Varian Medical Systems, manufacturer of TrueBeam, the technology is designed from the ground up to treat tumor targets with enhanced speed and accuracy. It can be used wherever radiation therapy is recommended, including the lung, breast, prostate, and head and neck. It enables radiation oncologists to treat patients quickly, while delivering precise doses of radiation to the target areas. One technique that can be performed with the TrueBeam is volumetric-modulated arc therapy, or VMAT. VMAT is a more comprehensive form of IMRT. With VMAT, radiation oncologists can shape the radiation dose around the tumor in a three-dimensional volume. “During VMAT, we can sculpt the radiation around critical structures in the body,” Dr. Chopra relates. “With it, we are able to give a high dose of very conformed radiation right around the tumor and stay away from areas such as the spinal cord, esophagus, heart and other organs. VMAT may also be the type of radiation therapy used in those patients with early-stage lung cancer who are not candidates for surgery. With VMAT using the TrueBeam, the radiation oncologist is able to deliver a high dose of radiation to destroy the lung tumor without surgery. Cancer Care Centers of Brevard is an independent, accredited, comprehensive oncology practice that offers a complete range of cancer treatment services, both medical and radiation oncology. In addition to IMRT, IGRT and VMAT on the TrueBeam radiotherapy system, the centers provide other advanced radiation services. These include CT scanning and simulation, electron beam radiation therapy, high-dose-rate brachytherapy and prostate seed implantation. “We are the largest independent, comprehensive oncology practice in Brevard County,” Dr. Chopra states. 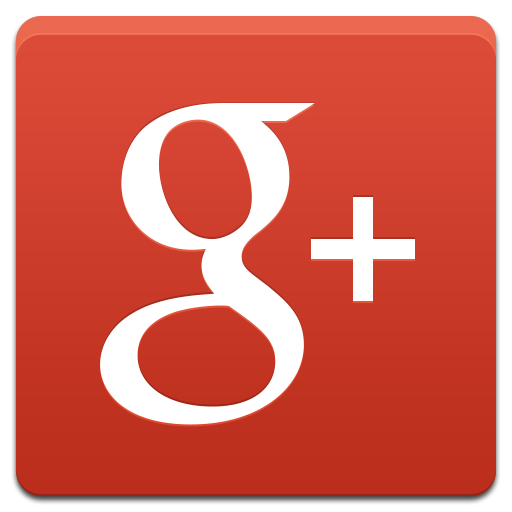 “In addition to full radiation services, we also provide leading-edge oncology and chemotherapy. We also have a genetic counseling program, and we perform CT and PET scans on site to help in the staging and management of cancer. “The centers are accredited by the American College of Radiology, the oldest accrediting body for both radiology and radiation oncology. Accreditation means we meet a standard of quality set by the ACR. Our medical oncologists are accredited by the American Society of Clinical Oncology through its Quality Oncology Practice Initiative. 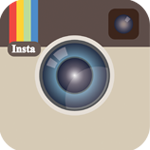 The centers participate in Medicare, Medicaid and all major medical insurance plans.